Hickcox discusses his feature debut, creature feature Soft Matter. 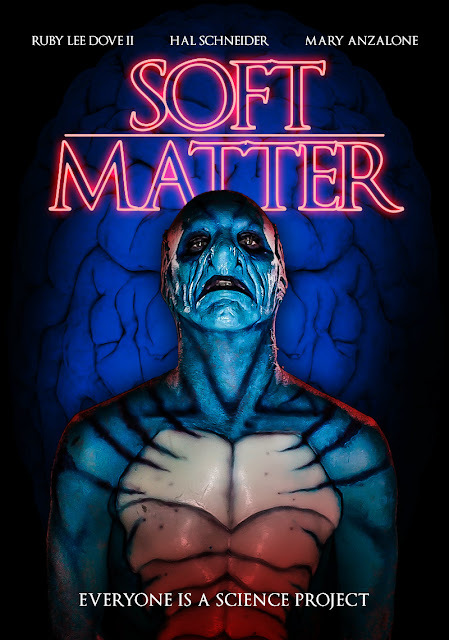 Jim Hickcox’s feature debut Soft Matter tells of two graffiti artists that break into an abandoned, reportedly haunted research facility in hopes of creating an art installation, but stumble upon a team of demented researchers who are in the process of resurrecting an ancient sea creature - whom they now must fight in order to not become the next experiment. Ruby Lee Dove II, Hal Schneider and Mary Anzalone star in the film, out May 22nd from Wild Eye Releasing. With its amazing premise and Hollywood’s penchant for Shape of Water-like movies right now, was there ever a moment when you considered taking Soft Matter to one of the big studios or did you always intend on doing it independently? Hollywood ain’t got time for me. What are the benefits of doing it independently? Getting it done. Even if it were a real big glitzy script and I had someone famous interested in acting in it and a way to get it in front of an executive, a studio would find a buzzier director and take way longer to get it out. Working independently, we took this from conception to final cut in about four months for very little money, and it’s obviously not as slick as it could have been with more time and more money, but that’s not what this film is about. Do you find the budget provides hurdles though? Are you constantly having to lose things from the script because you just don’t have the money to do it? You can lose things or you can reconfigure them. I wrote this script with the monetary restrictions in mind, so in this case it all played out basically as we wanted it to, but any time you’re up against money you can find a way if you’re crafty. Me, my producer Makena Buchanan (makenafilm.com), and a few credit cards. The cast and crew also mostly worked on spec because they trusted us (why? ), so technically they’re all invested too until we pay them off. How long of a shoot was it? I imagine a film’s budget dictates how long they get to shoot for? We shot for 11 days. That was largely because of the budget and a little because the building was scheduled for demolition. And what was it shot on? We shot on a Sony F3 with a Red zoom lens. The whole film is also shot through a Pro-Mist, but I don’t remember what grade. Where did you find the great locations? We found the hospice while scouting for a different film, and that’s the bulk of the movie. The other locations are all just places around town. The most notable, I suppose, other than the hospice, is the graffiti park, which is a place called the Hope Outdoor Gallery which, interestingly, is also slated for demolition. Tell us about your producing partners on the film - were they encouraging of your unique vision? Makena was the only other producer, and he’s worked with me for a while, producing my last short and several other films I’ve DP’d. He’s very supportive of my vision, and shares a lot of aesthetic interests. We’re in the process right now of starting a small production company (demonjanx.com) with another collaborator, Joseph Cornelison, which will hopefully become a consistent source of smart, cheap, primarily genre work. Are you happy with how it’s gone so far for the film? Definitely! I was happy to get it made, and super pumped to get distribution. As long as it’s making the rounds and getting people psyched about weirdo stuff, I’ll feel like we did good. Will you work with the same cast and crew on the next movie? I can’t guarantee that any of them would want to work with me again after I made them get gross in a mouldy haunted building, but certainly I loved them all a lot.